'We Were Eating Grass': Syrians Flee As Fight Pushes On Against Last ISIS Remnants The last U.S.-led offensive against ISIS in Syria is taking place in a remote desert region. The al-Hol refugee camp is overwhelmed with new arrivals. 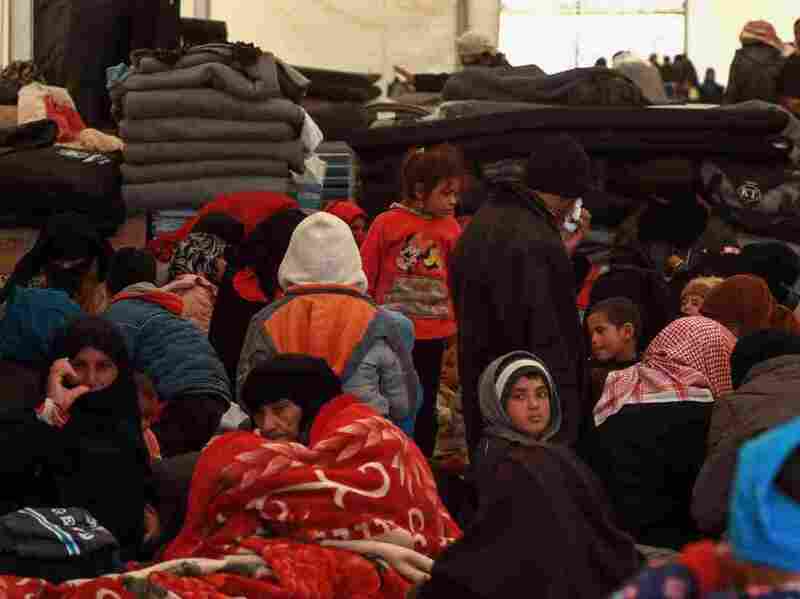 Displaced Syrians gather inside a tent in the al-Hol camp in northeastern Syria on Dec. 8. People fled towns where the U.S.-led coalition is fighting the last remnants of ISIS. The al-Hol refugee camp, in northeastern Syria near the border with Iraq, is overwhelmed with new arrivals. For years, the camp, run by Kurdish authorities with help from the United Nations and other international organizations, has housed thousands of Iraqi refugees. More recently, though, the camp has become home to large numbers of Syrians, fleeing towns where the U.S.-led coalition is fighting the last remnants of ISIS. Hundreds of thousands have become internally displaced, with many families forced to move multiple times. Hundreds of Syrian women, all dressed in black, line up at the camp to wait for tents and blankets in the bitterly cold desert wind. He says it took seven days to walk from the village of Sousse, one of the last areas in northeastern Syria still being fought over by ISIS and U.S.-backed Kurdish security forces. Ahmed, 15, escaped with some of his relatives after living for years under ISIS. Now they are staying in the al-Hol camp near the Iraqi border. Two of his uncles were captured and jailed by ISIS as they tried to flee their village. "We came with just the clothes on our backs," he says. "We slept in the desert in the rain." He and his family couldn't travel by car, he says, because ISIS charged $1,500 for cars to get through its checkpoints. Most people couldn't afford that, and even if they could, they feared their vehicles would be targeted by coalition air strikes. Two of Ahmed's uncles were captured by ISIS fighters at the checkpoint leaving Sousse. ISIS accused the men of being spies for the Kurdish forces, he says, and now they are in an ISIS prison. Ahmed's family managed to escape along with other families, he says, but their ordeal worsened as they made their way to the border. "On the way, a young girl and two men died on the road," Ahmed says. "They froze to death. Somebody in the group had shovels, so we buried their bodies. Everyone took turns digging." ISIS took over large swaths of northeastern Syria in 2014, and there has been a long and bloody battle to retake these areas from the group. In 2017, the U.S. coalition began offering air and logistical support, as well as funding for Kurdish ground forces, the Syrian Democratic Forces. Outside a tent, four children laugh as they shoot marbles on the dirt. They reached this camp a few weeks ago. "We haven't played games like these in years — it wasn't allowed under the Islamic State. We were only allowed to read religious scripture," a boy says. In a makeshift kitchen inside a large tent with two small windows, people have congregated to escape the cold. A stew cooking on a gas burner on the concrete floor has just been enveloped in flames before someone runs to turn down the heat. In another corner of the tent, a woman is crouching silently, washing laundry in a big orange plastic bowl. Everyone's noses have turned red and are running. 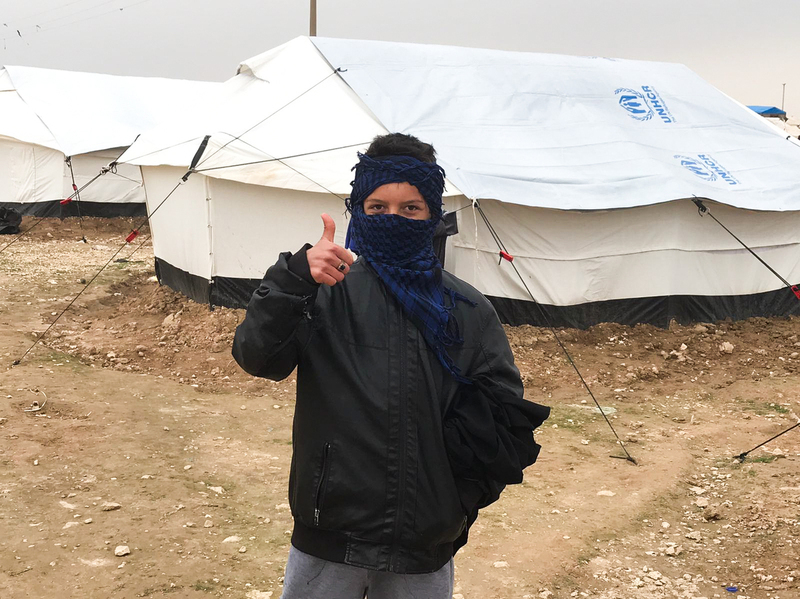 In the tent, Maryam, 19, says her family ping-ponged numerous times between Syria and northern Iraq, first fleeing their hometown of Abu Kamal three years ago. Her family had to leave Sousse, their most recent home, because they were starving. "In our last days, there was a siege, and we were eating grass... There wasn't even any bread," Maryam says. Maryam, who is wearing a purple scarf and has a shrapnel wound on her forehead, is accompanied by her relatives, Fatema, 28, and 29-year-old Hajar. Fatema says it was the coalition airstrikes that made them abandon their homes. The women say they fled on foot because they heard the U.S. coalition was bombing cars. "So many people have died who didn't deserve it," Fatema says. "Even if you were just waiting in line outside for food, you could get hit. And there are no hospitals for people to get treated. There's no medication because of the siege. There's nothing left." Abdullah Badry, Maryam's brother-in-law and a mechanic, says U.S. coalition bombs shattered his family. In 2017, he recalls, "I was at home waiting for lunch and my two kids were sitting outside when an artillery shell hit us. A piece of shrapnel hit my daughter's skull." Rimas, his 4-year-old daughter, died. His young son, standing next to him in the tent, still has deep scars on his foot. "There's no precision!" he says. "So many of the people being bombed are civilians. The bombing is random. I swear for every ISIS person you kill, you hit 20 civilians. I lived this in real time." President Trump has decided to pull U.S. troops out of Syria. But for now, they remain fighting ISIS, which the U.S. says threatens countries beyond Syria's borders. In a statement to NPR, a coalition spokesperson said the U.S. mission in Syria has not changed. "We will continue to fight to achieve an enduring defeat of ISIS," the statement said. Separately, the military has said it tries to avoid civilian deaths and has called ISIS a "ruthless enemy" that hides among civilians. Another man, 21-year-old Shadi, who fights with the U.S.-backed Syrian Democratic Forces, insists the air strikes have been effective. "I joined the SDF to fight ISIS. We were displaced because of ISIS, our lives were flipped upside-down because of ISIS, our area was destroyed because of ISIS," he says. "That's why. We saw the air strikes on the front line and they were precise. When ISIS progressed, I felt the air strikes were precise." But both he and Badry agree the intensity of this war risks creating more extremism. "When we are subjected to bombing, we must go rescue people," Badry says. "We end up having to pick up pieces of people. This increases violence. Our children used to fear the word 'death.' Now it's normal for children to see dead bodies. Now they stand over dead bodies, picking up the limbs with us; young children picking up limbs. This drives people to extremism because this strips people of their fear. There's just no fear left." When the women are asked if they think this war is necessary, "No, no, no!" they exclaim, talking over one another. "These are all civilians and they were hitting city centers. Not ISIS positions — just city centers. They were hitting us," Hajar says. "The only thing ISIS got involved with is telling us how to dress," says Fatema. "We should cover ourselves and keep our voices low. Other than that, I don't think they are a threat — because everybody is living their own life, nobody is getting involved with us." At the other end of the tent, Badry's wife is mixing a stew and laughing with some women. Reminded of the death of her daughter Rimas, her face becomes somber. She shrugs and says, "Maybe God gave her a break from this world filled with cruelty."